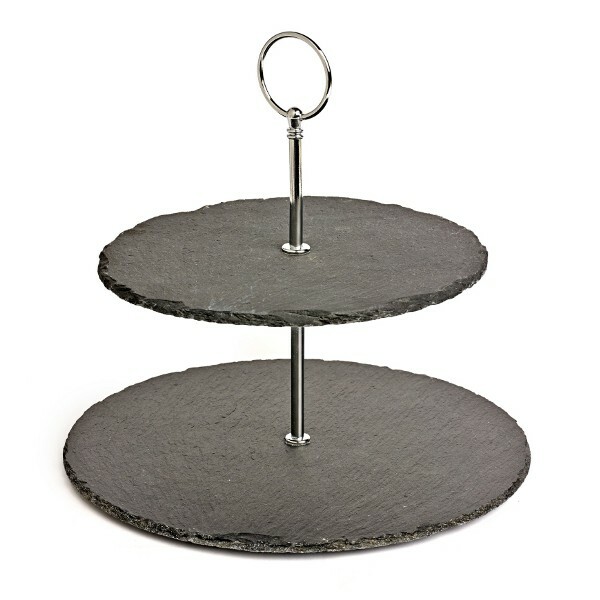 This personalised two tier natural slate cake stand makes a perfect gift for a birthday, anniversary or wedding. It is made of natural slate, and has a stainless steel handle. Included in the cost of the slate cake stand is engraving of up to 25 characters on one of the tiers. There is an additional charge for personalising the second tier. The text will be engraved around the curve, and will be left as natural slate. The first tier on the slate cake stand is approximately 30cm in diameter and has padded feet, and the top tier is approximately 20cm. The assembled cake stand is approximately 25cm tall, and is provided flat in a plain brown cardboard box for you to assemble. The postage rate for the personalised slate cake stand is band B. Note as slate is a natural product, the shape, size and colour of the personalised slate cake stand may vary slightly from the image here.